In an incredible act of forward thinking, the Commissioners Plan of 1811 laid out the streets and avenues of Manhattan above 14th Street—a logical, geometrical scheme far superior to the rambling, twisted roadways of the lower island. On paper, the Plan dissected the sprawling country estates of New York’s wealthy landowners which occupied what would become Midtown and Uptown Manhattan. Seven years after the publication of the Plan, Moore donated 66 tracts of land—a full city block—for the establishment of the General Theological Seminary of the Episcopal Church. The first building on what would become known as Chelsea Square was completed in 1826. The growing seminary fostered a growing community as brick and brownstone residences began cropping up on lots sold by Moore. Within five years a chapel, connected with the seminary, was deemed necessary and seven lots of land were leased from Moore, just a half block away on 20th Street. The chapel was organized in the summer of 1831 with the Rev. Benjamin I. Haight from the seminary serving as the slated “supply.” Clement Moore was highly instrumental in the design of the chapel, insisting on the Greek Revival style. It was an unexpected preference in a time when Christian churches mainly took the form of classical temples; often sporting columned porticos. The brown brick structure, a bit box-like, opened on February 4, 1832. The Chelsea neighborhood was still largely rural and undeveloped and the tine congregation consisted of only 22 members. Haight continued as supply until December 1, 1833, replaced a year later on November 2 by the Rev. Smith Pyne. After two years Pyne left and the Rev. Hugh Smith took over as rector of St. Peter’s. By now development in the neighborhood was booming and the congregation had greatly outgrown the little Greek Revival chapel. Smith initiated a new building project on the lot next door to the chapel—an impressive grey stone church in the English Gothic style. The new St. Peter’s Church would be the first Gothic house of worship in Manhattan. Built by James W. Smith, the beautiful stone church was dedicated on February 22, 1838 and the former chapel was converted into the parsonage house—an extremely early example of structural recycling. Dominating the structure was the soaring square bell tower, visible for blocks away. A massive stained glass window in the tower base flooded the interior with light. The entrance sat far back from the sidewalk above broad stone steps that created a wide plaza. The graceful 18th century fence was brought from the old Trinity Church downtown. At the time, surrounding Trinity Church, was a post-colonial period fence, erected between 1788 and 1790. The church building, dating from 1788, suffered severe structural weakness brought on by the heavy snows of the winter of 1838-39. The old church building was razed and a new one begun. The 18th century fencing and gate were given as a gift to the new St. Peter’s Church. Clement Moore remained an integral part of the St. Peter’s parish. He was an early warden and vestryman and donated the excellent organ. And he sometimes played it, as well. In 1904 an elderly parishioner recalled in a letter to The New York Times Moore’s playing in 1841 when the writer was a child. In 1853 the parish was building again; this time on the lot to the east of the church. To the rear of the lot a school house was constructed, completed that same year. All of this construction came with a price and St. Peter’s was, unfortunately, unable to meet the costs. A year after the school was completed the church applied to Trinity Church for aid to cover its staggering $30,000 debts. Trinity agreed to loan the church $25,000 on the condition that Clement Moore donate the land, still being leased, to the church. He agreed. Two years later St. Peter’s knocked on the door of Trinity Church once again, asking for financial aid. This time Trinity refused. And so St. Peter’s Church struggled on and survived. Despite its liturgical similarities with the Roman Catholic Church, the Episcopal Church consistently made clear the differences between its beliefs and those of “the Papists.” In 1870 the First Vatican Council pronounced a series of new tenets, including the infallibility of the Pope. The Rev. Dr. Beach wasted no time to give his opinions from the pulpit of St. Peter’s on March 20. Using St. Paul’s assertion to “Prove all things; hold fast that which is good,” he diplomatically cautioned the congregation not to simply scoff at the concept—since thousands of Catholics would accept it—but to follow Paul’s advice. The clergyman’s diplomacy was thinly veiled. In 1873 the parish built what “Church Philanthropy in New York” called “a fine Gothic Hall” in front of the school building. Now the wide swatch of property appeared to be a collection of three charming churches; each distinctively different and aligned in a picturesque grouping. The "fine Gothic hall" erected in 1873 looked much like a separate church or chapel. Dr. Beach died in 1897 after a pastorate of 36 years. In tribute to his service, the congregation collected donations from parishioners and friends of the rector. On October 7, 1900, after a considerable period of construction, the new altar, reredos, processional painting and a monumental stained glass memorial window were unveiled. 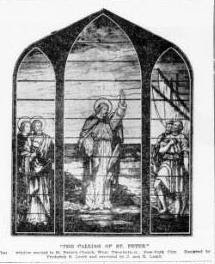 The window, “The Calling of St. Peter,” was designed by Frederick S. Lamb and executed by J. and R. Lamb. Its installation required part of a wall to be removed. Chelsea was now rapidly changing. The neighborhood was fully developed and areas of poverty and crime near the water front contrasted with dignified brownstone and brick homes along the side streets nearer 8th Avenue. In 1902 Rufus Rockwell Wilson, in his “New York: Old & New,” commented on the surviving quaintness of the church. In December 1936, as St. Peter’s Church began plans for its upcoming centennial, a gift arrived from England. At the annual memorial service for Clement Clark Moore a stone from the tower of Chelsea Old Church was presented. On February 22, 1938 the centennial was celebrated. A letter was read from the church’s oldest parishioner. Miss Annie Emery was one of the original congregants. Born on November 27, 1836 she was a year and a half old when the church was consecrated. Miss Emery understandably decided on a congratulatory letter “since she believes her strength will not permit her to be present at the service,’ said The Times. Roosevelt’s assumption proved true. Today St. Peter’s Church remains an important institution in the Chelsea community, although the make-up of its parishioners is somewhat different than in 1838. The Gothic Hall has been converted to an Off-Broadway theater by the Atlantic Theater Company; but the parsonage and grey fieldstone church remain untouched. wonderful post! incredible to learn about the fence!!! i always wondered why the tower had a sawn off look, and then i saw an old photograph of the church in which it had, on top of the tower, an elaborate, almost flamboyant, wooden gothic sort of pierced 'fence' with four spires on each corner as the 'fence' posts, that capped the angled stone constructions on the corners of the tower-is there any record about when that was removed? or even better, exciting plans for putting it back? The first rector of St. Peter's was Thomas Pyne, not Smith Pyne. The above information came from the 1846 book "The History of the Churches of All New York" reads that Haight "was succeeded in the Rectorship of St. Peter's, on Nov. 2, 1834, by the Rev. Smith Pyne, who remained nearly two years."